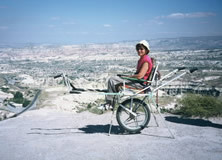 In 1996 Mephisto Voyage organized - together with a French association - the first trip to Cappadocia for people with a physical handicap. We realized that this type of program did not yet exist in the area and decided to take up the challenge of providing such a program. 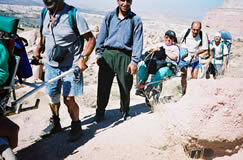 Since 1996 we are proud to have organized numerous trips to Cappadocia and the Toros Mountains for physically disabled people. 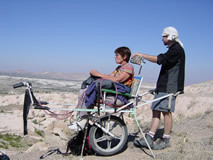 The excursions are made by using the Joelette system: a comfortable wheelchair on one wheel with adjustable foot-, head-rest and treadle. The Joelette chairs can be folded up and easily transported by car. We would like to invite you look at the programs we offer and possibly you will be tempted to come and stay with us. To view more photographs have a look at this page.